Spend the afternoon enjoying samples of BBQ, Baked Goods, Music, and so much more. 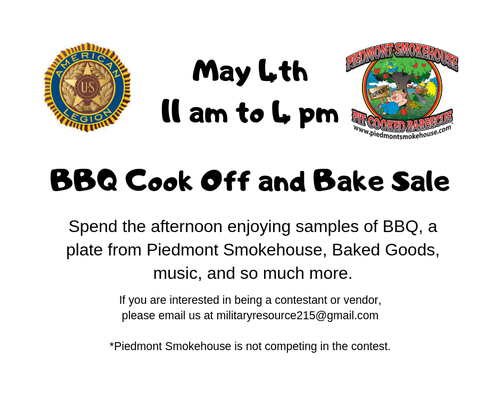 Piedmont Smokehouse has decided to not enter the competition but to sponsor it so others can showcase thier BBQ talents! So if you are up to the challenge, the cost is only $50. To sell your baked goods and wares it is only $25. Go to our website and download the application or contact us for the application.